Jacksonville, FL -- The Jacksonville Jumbo Shrimp (26-40, 54-80) scored five runs in the bottom of the sixth inning and came away with a 5-1 victory over the Mississippi Braves (36-29, 65-70) on Friday night at The Baseball Grounds of Jacksonville. The loss drops the M-Braves to two full games behind first-place Biloxi in third place in the Southern League South Division race, a half-game behind Pensacola who lost on Friday for second place. The M-Braves must now win one more game than Pensacola over the final three games and two more than Biloxi to make the playoffs. Despite the loss, Mississippi completed their second-straight winning month by finishing 16-11 in August after a 17-12 July. The 33 wins since July 1 is third-most in the Southern League. 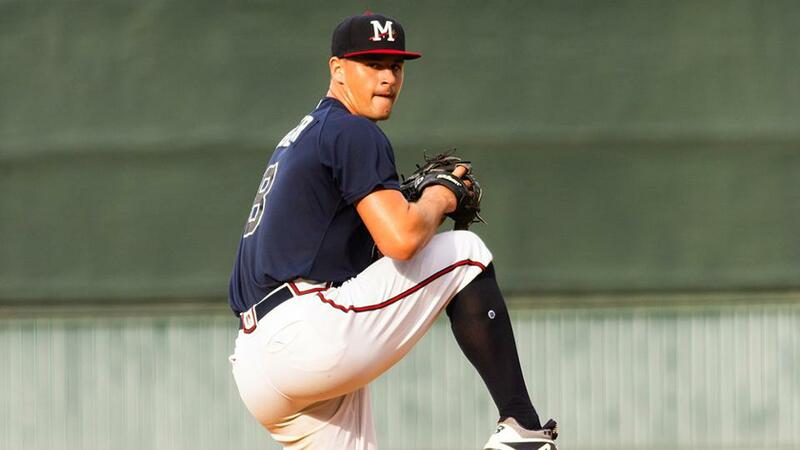 Kyle Muller (L, 4-1) became the first M-Braves pitcher to win his first four starts and the 6'7" Texan was making a strong push to make it five straight in the early stages on Friday. Muller sat down the first seven Jumbo Shrimp batters before giving up a single in the third inning. Muller notched a pair of strikeouts during a 1-2-3 fourth inning after his offense provided him a 1-0 lead. Tyler Marlette , Jonathan Morales , and Daniel Lockhart each singled to begin the top of the fourth. Ray-Patrick Didder grounded a Nick Neidert (W, 12-7) pitch deep in the hole at short and Jacksonville shortstop Joe Dunand threw to third for the force out, which allowed Marlette to score and the M-Braves led 1-0. Neidert exhausted 67 pitches over the first 4.0 innings, pitching in and out of trouble, including stranding the bases loaded in the second inning. He closed his outing by retiring eight in a row before turning it over to the bullpen. Muller faced just two over the minimum through the first 5.0 innings of his outing, retiring 15 of 17. Muller faced off against fellow pitcher Neidert to start the sixth and the Jacksonville hurler hit his first professional home run. The 1-2 pitched sailed over the left field wall tying the game at 1-1. Brian Miller followed by reaching on an infield single and then Monte Harrison got on board by just beating out a Muller throw on a bunt down the first base line. Bryson Brigman battled Muller and on a 2-2 pitch, smacked his first Jumbo Shrimp homer, just fair, down the left field line placing the home club up 4-1 and exciting the sellout crowd of 8,604. Muller finished his final regular-season start by striking out three and walking none, resigning four runs on six hits over 5.0+ innings. Dan Lietz took over for Muller and gave up an additional run to push the lead to 5-1. In total, 11 Jacksonville hitters came to the plate in the bottom of the sixth inning, pushing across five runs on seven hits. The 21-year-old Neidert left the game after 6.0 innings of one-run baseball, securing his Southern League-leading 12th win of the season. Neidert and relievers Ryan Newell and Tommy Eveld combined to retire the final 17 M-Braves hitters of the night. The M-Braves and Jumbo Shrimp will continue their six-game series on Saturday night with another doubleheader. A pair of Atlanta Braves Top-30 prospects will take the mound in RHP Ian Anderson (1-1, 3.38) and LHP Ricardo Sanchez (2-5, 4.36). Jacksonville will counter with RHP Dustin Beggs (1-1, 1.00) and RHP Michael Dugger (6-6, 4.05). First pitch of game one is set for 4:35 pm CT with coverage beginning at 4:20 pm on 103.9 WYAB, TuneIn Radio, and MiLB.TV. There will be an off day on Sunday before the season concludes on Monday with one game at 1:05 pm CT.
Tickets for possible playoff games at Trustmark Park will go on sale Friday morning at 10:00 am. For more information, call the M-Braves Front Office at 601.932.8788 or 888-BRAVES4, or visit www.mississippibraves.com. Individual tickets start at just $6!